The concept of a “tower defense” game isn’t particularly new: It’s where you build defensive structures to prevent successive hordes of invaders from attacking your territory. But Subatomic Studios has refined the genre for the iPhone in Fieldrunners, and the result is a truly handheld console-quality experience. Desktop Tower Defense, an Adobe Flash game, caught the world by storm when it was released in 2007, and it set off a wave of imitators. Fieldrunners sticks pretty close to Paul Preece’s original model, but with enough visual refinements to make the game a must-have for anyone looking for entertaining and engaging real-time strategy fun on their iPhone or iPod touch. Your home base—located off the screen on the right hand side of the game field—is under attack. All that stands between you and the enemy’s way of life is a large, open field and some impenetrable woods. So the enemy forces have to charge through an opening in the woods and across the field, and if they can make it to the other side, they’ll take some of your life away. And boy, is your enemy determined. He’ll throw everything he has at you: Infantry and big ogres with clubs. Guys on motorcycles. Giant armored robots. Tanks. Helicopters. It’s all coming. Running the Gauntlet: Building long corridors with punishing cannons is one way to run up the score in Fieldrunners. Here’s the rub: You have a small amount of money to build turrets, or towers, that can stop your enemy dead in his tracks. You have a few basic choices for your defense: You can build gatling guns, which don’t do a lot of damage but fire very rapidly; cannons that squirt out a goop that slows the bad guys down; missile launchers, which fire slowly but do a fair bit of damage; and tesla cannons—big electric towers that zap your enemies to a crisp. With each enemy you lay down, your defense coffers swell. And you can use that money either to upgrade your defenses (each tower can be upgraded three times) or to purchase additional towers. 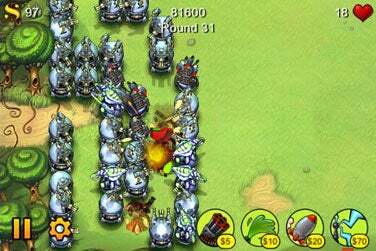 The more towers you build, the more damage you can do, provided you can keep the enemy in the line of fire. That’s why many players, me included, like to build gauntlets, of sorts—long corridors of guns and cannon that the bad guys need to run down (well, everyone except the helicopters, which just fly over) to get to the other side. It’s expensive but it’s an effective way to run up your score. Fieldrunners sports three levels of difficulty: each level affects your weapons’ effectiveness, the enemies’ toughness, and how many points you get. What really separates this from Desktop Tower Defense and other more simple Flash games is the production quality. The graphics are top-notch—every bit worthy of what you would find on a handheld game console like a Nintendo DS or a Sony PlayStation Portable. Unfortunately, there’s no sound. I guess that’s both a blessing and a curse: it makes it convenient to play in meetings when no one is looking over your shoulder, though lack of sound doesn’t add much to the gameplay experience. Subatomic is continuing to develop the game, as well. It just released a second update—version 1.2—that adds new towers, new fieldrunners and “some additional surprises” for players. It’s good to see the developer continuing this as a work in progress. Regardless, Fieldrunners is fantastic as it is now, and at $4.99, fairly priced for the amount of time you’ll spend playing. Fieldrunners is compatible with any iPhone or iPod touch running the iPhone 2.x software update.